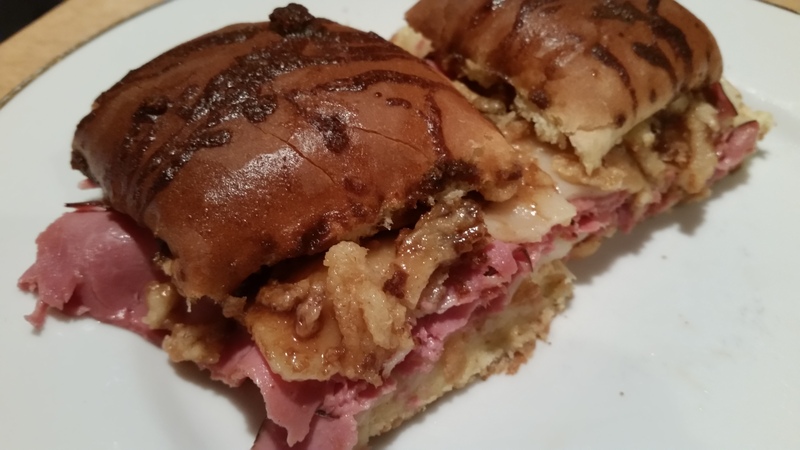 Au Jus Roast Beef Hawaiian Sliders – What's for Dinner Moms? Yes, more sliders. I love these little sandwiches during this busy time of year. I keep a package of rolls on hand to feed my kids friends, have a quick dinner on nights I don’t want to cook (add a hearty salad – believe me it works), or to serve on those football game days. You can make them so many different ways there is no getting sick of them! These were a super hit. You don’t need to add the onions but they add so much flavor to the sandwiches. The sandwiches were okay without the onions but they were REALLY good with the onions. Serve these with a hearty green salad and you have dinner ready in no time! Tip: If you like your roast beef rare or medium you will want to make sure to use really rare roast beef in this dish. If you prefer well done meat then use fully cooked roast beef. The additional 20 minutes of cooking makes a difference in the meat. Preheat the oven to 350 degrees. Spray a 9 x 13 pan with non-stick spray or grease with butter. Without separating the rolls, slice the package of rolls in half horizontally. Mix into the melted butter 1 tablespoon of the au jus seasoning mix, Worcestershire sauce, minced garlic, onion powder. Whisk until well combined. Top the rolls evenly with this mixture but just make sure all the rolls are entirely coated. If you have leftover put it in the fridge to top steak or bread at another time. Bake the sliders uncovered until the cheese is gooey and the tops of the rolls are golden brown — about 15-20 minutes. Remove and cut the sliders with a very sharp knife. While the sliders are baking, take the remaining au jus mixture and place in a small saucepan over medium heat. Add 2 cups cold water and whisk. Bring to a boil and then reduce the heat to a simmer to allow it to slightly thicken. Serve au just with the sandwiches. Oh my gosh, YES! 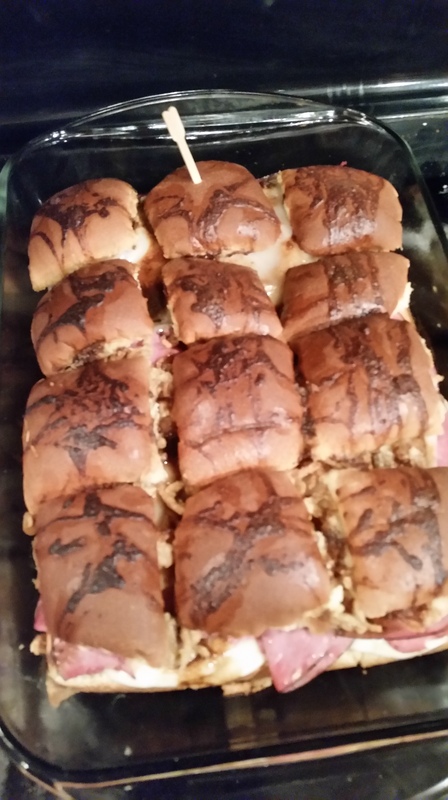 I do love Hawaiian roll sliders, especially with roast beef and au jus. And Yes to the onions for me too! Thanks, the onions were perfect for me. I love mini forms of anything so these are right up my alley!